If you suffer from vertigo, do not go to the Horseshoe Bend Overlook. Or if you do travel there, don’t get too close to the edge; there are no guardrails of any kind. Horseshoe Bend in the Colorado River with its 1000-foot drop is a awe-inspiring sight, one of Mother Nature’s gifts. In 2007 as I was en route to the San Diego area, I traveled to the Page, Arizona area. Hiking out to the edge of the overlook at Horseshoe Bend was one of my adventures there. 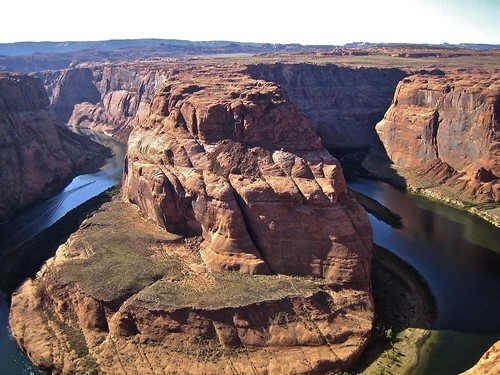 Here’s information from Wikipedia: Horseshoe Bend is the name for a horseshoe-shaped meander of the Colorado River located near the town of Page, Arizona, in the United States. It is located 5 miles downstream from the Glen Canyon Dam and Lake Powell within Glen Canyon National Recreation Area, about 4 miles southwest of Page. Accessible via a ½-mile hike from U.S. Route 89, it can be viewed from the steep cliff above. According to Google terrain maps, the overlook is 4,200 feet above sea level and the Colorado River is at 3,200 feet above sea level making it a 1,000-foot drop. For a slideshow, click on the photo. To view full screen, select the icon in the lower-right of the photo. Click on Show Info to view captons if they do not appear. To return to the website, press the Ecs key.